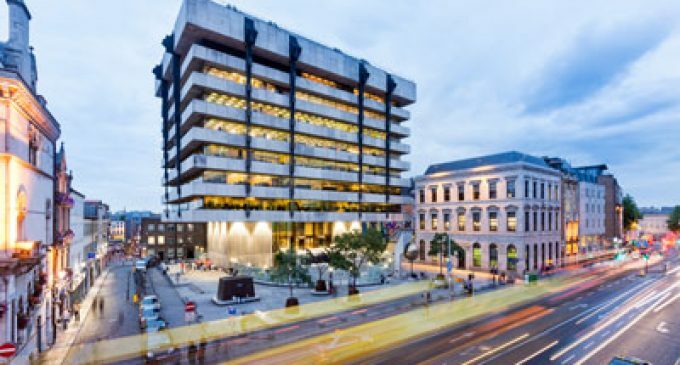 Real estate companies Hines and Peterson Group have entered a partnership to acquire two iconic Dublin properties – the Central Bank buildings on Dame Street and 2 Grand Parade in Dublin 6, it was announced on Tuesday. These two prime acquisitions represent Peterson Group’s first investments in Ireland and also its first partnership with Hines. Hines and Peterson Group are currently considering future plans for the Central Bank buildings ahead of taking control of the property. The main building was constructed in 1978 and designed by architect Sam Stephenson. The sale includes the adjoining Annex, Commercial Buildings and 6-9 College Green. Originally constructed in 1962, 2 Grand Parade was the former headquarters of PJ Carroll’s Cigarette Company and subsequently Irish Nationwide Building Society, but is now fully leased to Amazon. The 1.7 acre site includes an office building comprising eight stories and a floor space of 52,000 square feet and benefits from a highly convenient location adjacent to Charlemont LUAS stop, which is just a short journey from St. Stephens Green.